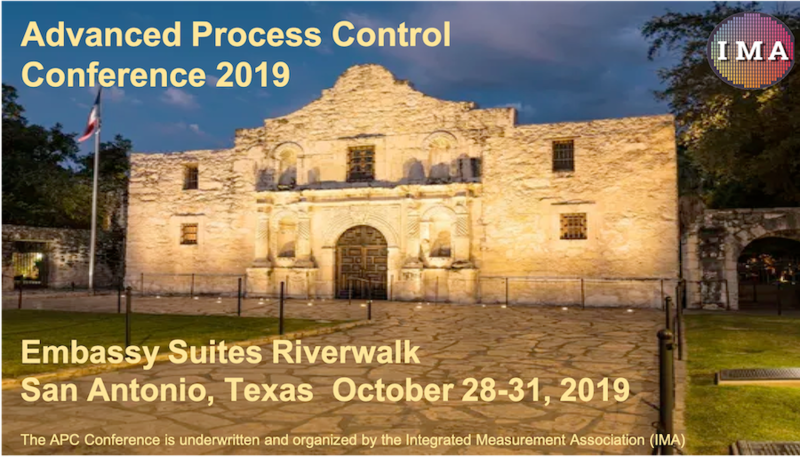 The 2019 APC Conference will be held on October 28-31, 2019 at the Embassy Suites Riverwalk hotel in San Antonio, Texas. The 2019 tutorials have not been finalized. Tutorials will be held on Monday, October 28, 2019. Check this website in May for updates. Registration will open when the tutorials are finalized. Registration fees are the same as 2018. See the "FEES" tab. The Advanced Process Control Conference (APC) will address APC smart manufacturing needs & solutions for microelectronics and related industries that also require high precision manufacturing. The conference is built around tutorials, technical presentations, poster sessions, and exhibits. The Integrated Measurement Association (IMA) underwrites this event. This is the 31st annual conference. As manufacturing processes become more complex with greater yield, quality and cost objectives, APC methods to maximize productivity and quality become an increasingly important component of Smart Manufacturing solutions. These APC methods include traditional capabilities of diagnostics and process control, but also include emerging smart manufacturing / Industry 4.0 capabilities such as prediction technologies and the “digital twin”, Industrial Internet of Things (IIoT), supply chain optimization and big data solutions. Semiconductor, memory, photovoltaic, display, MEMS, LED, pharmaceuticals, chemical and other industries are experiencing unparalleled cost and quality pressures. These demanding objectives have made APC enabled smart manufacturing absolutely critical for profitable manufacturing. The Integrated Measurement Association is pleased announce the APC Conference 2019 Call for Papers. This call for papers is directed to the microelectronics industry, but also to any discrete manufacturing industry that has similar requirements of productivity, quality and precision. Manufacturers, equipment suppliers, universities, research institutions, software providers, sensor, and metrology suppliers are all encouraged to submit abstracts. The conference will focus on technical advancements, current challenges, synergy between industries especially up and down the supply chain, and future needs and trends. Suggested topics for submitted abstracts and the abstract submission procedure are described below. By submitting an abstract you agree to be bound by the following rules and procedures. Submissions should consist of an informational page (title, authors, email), one or more pages for abstract text (motivation, approach, results), and one or more pages for figures, charts, data tables, and/or pictures. Abstracts must include a description of the Motivation for the work, a description of the Approach used, and a description of the Results. Abstracts and presentations must be technical in nature. Abstracts that are simple product descriptions or are commercially focused will be rejected. Abstracts marked confidential or proprietary will be rejected. Only MS Word and PDF file formats are acceptable. A link to the downloadable abstract submission form is below on this conference website. Abstracts must be in English. Text, tables and graphics must be embedded into a single file. All accepted abstract authors must submit both a PowerPoint file and a PDF file of their poster or oral presentation. Presenting authors (oral and poster) must register online for the APC Conference. The PowerPoint file will be used during oral presentation at the conference. The PDF version of the presentation (oral and poster) will be included in the conference proceedings. A suggested PowerPoint Poster template and an oral presentation PPT template, in 16:9 aspect ratio, are available for download, see links below. For a copy of specific abstracts and presentations from previous APC Conferences (2001 - 2018) please send an e-mail with the citation to vaneck@APCconference.com. Note that not all abstracts and presentations are available and terms and conditions may apply. Click here for additional information. The Integrated Measurement Association (IMA) underwrites the APC Conference. We can be reached for customer service by email or telephone. If you would like additional information about the APC Conference or if you would like to be added to our distribution list please drop us an email at vaneck@APCconference.com.